This presentation is intended to review and raise issues with respect to Federal legislative proposal H.R. 25 (109th): Fair Tax Act of 2007, the “Fair Tax”. Because the title of the proposed legislation prejudices the discussion, this presentation refers to this proposed legislation as H.R. 25. * Implementation of a tax exclusive flat rate national sales tax of 30% on all goods and services sold at retail (ensuring that goods and services are only taxed a single time). Exports would be exempted from the national sales tax. Property purchased for investment would be exempted from the sales tax. Retail purchases of goods and services by government would be subject to the 30% sales tax. * The flat rate national sales tax would be administered by agencies organized in the individual states, sales tax administrating authorities. If a state or states choose not to administer the flat rate national sales tax, the Federal Department of the Treasury would become the sales tax administrating authority in such states. In all events, Treasury would have general rule making responsibilities. * All lawful residents would receive a monthly “prebate” intended to be equal to the sales tax on cumulative expected monthly purchases at the poverty level. Unlawful residents would not receive the prebate. The prebate would be paid by the Social Security Administration acting upon information provided by sales tax administrating authorities. * H.R. 25 significantly revises the definition of self employment income for social security benefit calculation purposes. With all of its complexity, the current Internal Revenue Code is a more evenhanded approach to collecting necessary Federal revenues than H.R. 25. This is not to say that the author believes the current Internal Revenue Code is the right long term answer for the United States; it is to say that H.R. 25 is not the right long term answer. H.R. 25 eliminates any differential in the rate of taxation between the first dollar purchase over the poverty line by low income Americans and the last dollar purchase by the richest Americans. In any state where there is a decision to eliminate their state income tax, the combined Federal, State, and local flat sales tax rate could easily exceed 43%. H.R. 25 would result in an immediate reduction in purchasing power upon implementation for existing savings which have previously been subject to U.S. income taxes (double taxation). H.R. 25 would result in a very significant competitive purchase price advantage given to an investor purchasing a new residence over a couple wishing to purchase the same property as a home. H.R. 25 would result in an on-going and significant reduction in purchasing power for many social security recipients with other sources of income or savings. H.R. 25 would result in the elimination of the safety net provided by the Internal Revenue Code in reducing Federal taxes for victims of disease and disaster, the elimination of incentives to save through pension plans or investment retirement, and the elimination of credits and deductions for child care. H.R. 25 would result in an increase in purchasing and investing power for very high wage earners and the ability of the wealthy to earn profits from investments and reinvest without taxation while low income Americans are paying an H.R. 25 designated 30% Federal sales tax on food. The ability of the wealthy to pass along exceptional levels of never taxed wealth, tax-free, generation to generation, seems a prescription for a feudal system. Under H.R. 25, while there could be a reduction of compliance requirements for wage earners and retirees, compliance activity for the self-employed and service providers would increase. If a state did not eliminate their state income tax, there would be no compliance reductions for wage earners or retirees. H.R. 25’s proposed change in the definition of self employment income for the ultimate receipt of social security benefits is bizarre, unfair and unworkable. Under the language of H.R. 25, many self employed individuals currently earning social security benefits would no longer be earning any social security benefits. H.R. 25 anticipates that virtually every state will willingly agree to become a sales tax administrating authority. Given the proposed fee for this administrative task and the political risk that would accompany this decision, it is possible that not a single state would decide to become a sales tax administrating authority. The very notion of initially and annually registering 300,000,000 lawful citizens, providing a monthly check to each and believing this can be accomplished confidentially, efficiently and without fraud has at least a touch of unreality to it. H.R. 25 could not be implemented until (1) a sales tax administrating authority was established and successfully organized and staffed in every state, (2) every lawful resident given a legitimate social security card, (3) every lawful resident registered confidentially and without fraud, and (4) this information transferred to the Social Security Administration and reviewed for duplicate social security numbers and general fraud issues. The economic risks, particularly in the immediate aftermath of implementation, are far too significant to the overall economy to chance. There are conflicting studies projecting the necessary tax rate required to achieve neutral tax revenues under H.R. 25. There have been no micro-economic studies with respect to the impact of H.R. 25. The lack of study with respect to the prices of high volume, low margin products (food) is especially worrisome. Taxing state and local governments on their purchases and providing no interest rate advantage to state borrowings must result in significant tax increases at the state level. Basic tax planning that would occur in the final year of the Internal Revenue Code and the first year of H.R. 25 would reduce Federal revenues by a very significant amount. H.R. 25 is fraught with legal uncertainty. There are constitutional arguments that H.R. 25 would be unconstitutional with respect to constitutional limits of Federal taxing power. There would be state and local challenges with respect to the exclusion of unlawful residents from the receipt of the prebate. The World Court could probably weigh in with respect to trading issues. With every major conceptual change, there will be thousands of different interpretations of the rules. It would take years to sort these interpretations out. During that period, Treasury would issue volumes of rules and regulations. The opportunity for Social Security fraud would increase with respect to actual employment. Should U.S. products begin to appear in the world market place at prices significantly lower after the removal of Federal income taxes, tariff responses could be expected. With exports untaxed, U.S. goods could be 30% more expensive for Americans than the remainder of the world. H.R. 25 would replace the Federal income tax, payroll taxes and the estate and gift taxes with a flat rate national sales tax. After reimbursing (in advance) lawful citizens for the estimated sales taxes levied upon the dollar value of estimated necessary retail expenditures at the estimated national poverty level, all lawful citizens would pay a flat rate national sales tax on all purchases of retail goods and services. Unlawful citizens would not receive a prebate. H.R. 25 represents a philosophy of tax collection without any attendant social or economic policies. There has been a significant amount of discussion regarding the proposed sales tax rate in H.R. 25. H.R. 25 proposes a 23% “tax inclusive” sales tax rate. Sales taxes are not traditionally described in a “tax inclusive” manner. Sales taxes are traditionally described in a “tax exclusive” manner. A “tax inclusive” sales tax rate is a percentage of the total register price. A “tax exclusive” sales tax is a tax calculated on the purchase price before the tax is added. As shown below, a 23% “tax inclusive” sales tax rate is equal to a traditionally described “tax exclusive” sales rate of 29.87013%. This paper refers to the tax rate as proposed in H.R. 25 as 30% (rounding 29.87013% to 30%) so that the tax rate may be more accurately compared and contrasted with other sales tax rates which are traditionally described on a tax exclusive basis. Using the traditional “tax exclusive” rate of 30% will neither increase nor decrease the tax shown for any transaction; it provides only clarity in presentation. Reimbursements, Tax Exempt Income, etc. Reimbursements, Tax Exempt Income, etc. The FairTax benefits retirees who depend mostly on Social Security. For older, low-income households, the FairTax generates a major reduction in remaining lifetime taxes. Again, the reason is that the elderly not only continue, under the FairTax, to receive the same real Social Security benefits, they also receive the FairTax prebate. The average Social Security benefits for a retired couple living solely on Social Security are $18,776. The FairTax prebate for this couple is $4,697 which is $381 more than the FairTaxes the couple would have to pay if they spent the entire $18,776 on taxable consumption. Every word of the above paragraph is accurate. However, the inference that the result is good for this retired couple is incorrect. Under H.R. 25, the purchasing power of the retired couple referred to in the example is actually decreased under H.R. 25 from $18,776 to $18,704. Note that if this retiree is also spending funds from savings, the reduction in purchasing power is enhanced under H.R. 25. * At implementation, existing savings will have diminished purchasing power of 30%. * At implementation, high earning citizens with deferred income from such items as pension plans and stock options would have immediate increases in purchasing power. * At implementation, investors would have the ability to sell investment assets without Federal taxes. The proceeds of such gains would be immediately available for reinvestment without any Federal tax consequence. * At implementation, citizens would be able to make unlimited gifts without tax consequences and estates of any size would be able to be passed from one generation to the next without Federal taxation. * Ongoing, many, if not most, retired individuals receiving social security and currently paying Federal income taxes or spending cash savings would have diminished purchasing power. * Ongoing, the purchase of a home built after implementation of H.R. 25 would cost 30% more for a family than an investor. * Ongoing, existing alimony agreements would become a serious problem. Such agreements contemplate increased buying power for the payor of alimony through tax deduction and decreased purchasing power for the recipient through the payment being taxable income. For many individuals, the compliance requirements of H.R. 25 would be significantly increased. Service providers, investors owning property, and people performing part time jobs would be required to file monthly sales tax reports with the sales tax administrating authority. * Self employment benefits would be calculated differently for the self-employed following implementation of H.R.25. Income calculated in a traditional manner would no longer be the basis for social security benefits for the self employed. * Each State would be faced with a series of difficult decisions with respect to whether it chooses to become a sales tax administrative authority and/or makes changes to its own method of taxation. Each of these decisions would include both political and financial implications. There is no assurance that a single state would determine to become a sales tax administrating authority. Where a state determines not to become a sales tax administrating authority, the Federal government would assume that role. * In states that determine to maintain their existing state income taxes, there would be no reduction in compliance activities regarding the income tax and there would be increased compliance requirements under H.R. 25. The administrative costs of maintaining an income tax at the state level without the existence of a Federal income tax would be very substantial. * Because H.R. 25 requires state and local governments to pay the national sales tax and because the states would lose their ability to borrow funds at favorable tax exempt rates, it is possible that state legislators would have no interest in doing anything to make the process of implementing H.R 25 easy. The Federal government will lose its ability to influence the economy or individual behavior through modest or significant changes in the Internal Revenue Code. The application of H.R. 25 to purchases by state and local governments would increase the costs of state and local governments and require an increase in state and local taxes. The loss of the rate advantage available to state and local government in issuing tax-exempt bonds would increase the costs of state and local government and would require increases in state and local taxes. At implementation, there would be immediate impacts on pricing and disintermediation in certain markets. Prices on high volume, low margin items, such as food, would likely increase dramatically. At implementation, foreign buyers of American retail products would have a 30% competitive price advantage over Americans. Tax planners would legally, easily, successfully and materially reduce Federal income tax revenues in the year precedent to implementation of H.R. 25 and successfully reduce Federal national sales tax revenues in the year following implementation. With H.R. 25 eliminating the Internal Revenue Service two years after implementation of H.R. 25, it can be projected that auditing of tax returns for the final year of the current Federal income tax would be very low. Therefore, it can be projected that fraud by both non-filing and enhanced fraudulent deductions or unreported income would be greatly enhanced. That a national sales tax rate of 30% would produce revenues equal to the revenues produced by the existing income, payroll, estate and gift taxes is unproven. Ongoing, there will be a significant incentive to spend money in other countries; there would also be a significant incentive to leave retail purchases in other countries. There would be a significant incentive for individuals buying second homes to locate those homes outside the United States and avoid the 30% national sales tax on that purchase. There would be a significant incentive to make retail purchases in other countries and not report their use upon bringing them into the United States. Large retailers would be required to post bonds of 1.5 times their average monthly sales tax liability, amounts well beyond the financial capabilities of some businesses. · Proceeding with a new form of Federal taxation without a constitutional amendment to assure that the methodology is constitutional would be foolhardy. Without a constitutional amendment, surely to be challenged under the Constitution is the ability of the national government to tax purchases by the states. Challenges might also be offered on constitutional grounds with respect to the ability of the national government to impose a national sales tax and the exclusion of illegal residents from receiving the prebate. · State & local legal issues could be raised including the relationship of taxing authorities with Immigration Customs & Enforcement. Would the state sales tax authorities attempt or be required to inform Immigration Customs and Enforcement of the location of families which included unlawful residents. Challenges might arise with an interpretation of the law to be effectively requiring national identity cards. · State and local legal issues might be raised as to the propriety of providing prebate benefits to legal residents who are not citizens. · There could be a plethora of international legal issues including treaty enforcement and unfair trade issues. · Charging a sales tax on purchases by the Federal government and subsequently paying two levels of administrative fees to collect this tax would increase the cost of Federal purchases by the ½% fees. · With the elimination of payroll taxes and income taxes, adding employees to payroll lists for purposes of increasing individual social security benefits would come without cost to employers. The Social Security Administration is neither staffed nor sufficiently experienced to audit for such issues. Immediate Loss of Buying Power – The current purchasing power of after-tax savings would immediately decline by 30%. Cash that would have purchased $1000 of goods and services would now only provide for $770 in purchases of retail goods and services. Loss of assets – Any current holder of long term tax exempt debt would immediately sustain a dramatic decrease in the value of their assets. Without the tax-free advantages of state and local debt, new investors would dramatically discount the value of existing long term state and local debt. For individuals with pension plans or investment retirement accounts, under the existing Internal Revenue Code, there are penalties as well as Federal income taxes if they take access to those assets before age 55. These penalties would disappear as the funds could be immediately accessed without Federal tax. For individuals who receive the funds after age 55, the funds are currently subject to income taxes at the time of receipt. With implementation of H.R. 25, these individuals would be able to receive these funds, for which they had previously received a reduction in federal income taxes, tax-free. These taxpayers would also receive the earnings that these funds had previously generated without taxation. That should be more deeply considered. For individuals that have invested in real estate for their entire lives, because of existing Federal income tax rules, many have never paid Federal income taxes on the appreciation of their assets. For these individuals, the only tax to which they would currently be subject is the inevitable estate tax. Their increase in both buying power, investment power and the ability to pass wealth tax-free through generations explodes with the end of gift and estate tax. For those with untaxed gains in investment assets, there would be an instant ability to generate gains and pay no Federal taxes prior to reinvestment of the proceeds. For example, assume a taxpayer purchased a stock in 1980 for $100,000 and that stock is now worth $500,000. Today, if that individual sold that investment, he would pay a Federal capital gains tax of 15%, $60,000. If the income tax were repealed, that person would have the entire $500,000 to reinvest. None of these benefits would accrue to America’s low income taxpayers. Prebate - H.R. 25 provides that all lawful residents receive a monthly check, a prebate equal to the Federal income taxes imposed on the expected retail purchases of an individual at the poverty level. The prebate provides a national sales tax exemption at precisely the poverty level. H.R. 25 provides this prebate to all lawful residents regardless of income or wealth. No amount is provided for unlawful residents. Wealthy would receive exactly the same prebate as America’s poorest legal residents. H.R. 25’s flat rate national sales tax rate, for a two adult household, would indirectly exclude taxation on $1700 of monthly retail purchases and services by delivering a monthly prebate check or making an electronic deposit of $391. For each additional member of the household, an additional $287 of retail purchases would be excluded resulting in an additional $67 monthly rebate amount. All purchases of retail goods and services would be taxed at the national flat-tax sales rate of 30% with the expectation that the prebate amounts would be used for the purchase of necessities. There is no mechanism to ensure that the prebate would be spent on sales taxes for the necessities of the individual or his family. There would be no assurance that a child would not go hungry and the funds spent on books, drugs, alcohol or chocolate bars. Impact on recipients of Social Security - Under current law, social security benefits for married couples are untaxed until the sum of their other taxable income (interest and other pensions) plus one-half of social security equals $32,000. As income grows, up to 85% of social security can be taxed. The purchasing power of a couple, totally dependent upon Social Security, receiving $18,776 of social security income decreases by 3.74% under H.R. 25. If that couple has other income, the impact of H.R. 25 is a further diminution of their purchasing power. Middle income retirees would see their purchasing power reduced significantly from their income and by a further reduction of 30% on any of their savings that are expended for retail goods and services. With respect to the taxes on their pre-H.R. 25 savings, these taxpayers would be subjected to double taxation at the Federal level. For many social security recipients, H.R. 25 decreases purchasing power. Impact on High Wage Earners - At the highest income levels, current Federal income taxes approximate thirty percent (after deductions for state income taxes). If a hypothetical athlete or actor earns $50,000,000 from salary and endorsements, his or her approximate Federal income taxes would approximate $15,000,000. (Contrary to urban legend, it is virtually impossible to avoid this tax unless the athlete or actor is donating significant amounts to charity.) To pay the same amount of taxes with a national sales tax, the professional athlete or actor would need to make, after H.R. 25 sales taxes, retail purchases of over $38,000,000. It is axiomatic that an individual who already owns his home and a few favorite toys is unlikely to annually have this amount of retail purchases of goods and services. As a result, the high wage earner is going to have a dramatic reduction in Federal taxes paid and will have funds far in addition than under the current Internal Revenue Code to invest. Impact of H.R. 25 on Relative Position of Home Buyer and Rental Residence Investor – H.R. 25 provides that the purchase of a new home by a buyer with the intent of occupying the home for his or her family is subject to the flat rate national sales tax. H.R. 25 provides that an investor purchaser of that same residence would not be subject to the flat rate national sales tax. That taxpayer would charge his renters the flat rate national sales tax. The result is that the investor buyer would have a 30% price advantage in competing with the home buyer for new residential property. The purchase price for the investor would be $300,000; the young couple would pay $390,000. Impact of H.R. 25 on Personal Tragedy – The current Federal income tax allows a deduction for casualty losses in excess of 10% of income and medical expenses in excess of 7.5% of income. Through these deductions, the taxpayer who has a casualty (Katrina / San Diego fire) effectively receives a deduction in his or her Federal taxes. Under H.R. 25, there is not a reduction in taxes and the citizen must pay an additional 30% sales tax on the lumber to re-build his home after a major fire and/or the wonder pill that is keeping his child alive. This is contrary to the historical spirit of America. Tax planners will be attracted to H.R. 25 like bees to honey. In the initial planning to decrease taxable income in the final year of the current income tax system and in making retail purchases proceeding the first year of the national sales tax, tax planners would puncture expected Federal revenues in both years. * Acceleration of any business expenses that might be deductible – maintenance, repairs etc. * Deferral of salary and other income through the use of any device possible including Rabbi trusts, late payments of bonuses etc. * One particularly elegant tax planning device would be the legal payment to a self employed retirement plan. This payment is due on April 15th, at the time of filing the personal tax return. A taxpayer in the 34% tax bracket could make this payment, a maximum of $40,000 on April 15th and reduce his or her taxes by $13,600. On April 16th, that person could retrieve the money from their retirement plan tax-free. * Corporations would defer their dividends to avoid the income tax on their shareholders in the final year of the Internal Revenue Code. * The list, while not endless, would be very extensive and totally legal. With the expectation of the demise of the Internal Revenue Service and a unique reduction in the number of audits by the Internal Revenue Service, there would be the expectation of increased fraud in the final year of the Internal Revenue Code. After Adoption of H.R. 25 - For wealthy U.S. individuals, H.R. 25 would encourage them to purchase and keep assets overseas. There would be a 30% price advantage to a villa in Mexico or a castle in Ireland versus a second home in the United States. Other big ticket assets such as yachts etc. would also be best kept and purchased offshore. Every possible ambiguity would be resultant in plans to avoid a national sales tax. The Treasury would need to continue to propose laws and write regulations to insure that the intended Federal revenues were collected. Tax lawyers and accountants would be there every step of the way to attempt to reduce, legally, their clients’ taxes. Self employed individuals currently receive social security benefits based upon their self employment income. Self employment income for social security purposes is currently calculated in a manner identical to the calculation of taxable income for Federal income tax purposes. H.R. 25 calculates self employment income as gross payments for taxable property or services less the sum of gross payments for taxable property or services and wages. This appears to be a mistake of significant proportion. The application of H.R. 25, as proposed, would eliminate any consistency between the historical calculation of earnings from self employment and that required under H.R. 25. The proposed change in the rules could be viewed as inappropriate by both retirees and current self employed individuals. Any business that was selling products for re-sale would have no gross payments received for taxable property and therefore no self employment income, regardless of the business’s actual income. In a growing business, where the profits are poured back into the business to buy more equipment, the self employed owner would be garnering no social security benefits. If self employment income was calculated in the traditional manner, the taxpayer would be required to calculate taxable income under the current Internal Revenue Code after implementation of H.R. 25. This would require the continuance of the Internal Revenue Code and the continuing requirement of a calculation of taxable income for the self employed. It would result in the promise of lesser compliance costs and the elimination of the Internal Revenue Code being inaccurate. It is uncertain whether the administrative tasks required by the Federal government including the Social Security Administration and the participating states can be accomplished in a timely and fraud free manner. It is uncertain whether the costs of implementing and administrating H.R. 25 would be less than, equal to, or greater than the current costs of the Federal government and the states of administrating the current Federal income tax. The costs of collecting the Federal taxes under H.R. 25 (1/2 of one percent) would approximate the entire 2008 budget of the Internal Revenue Service. With increased costs for the Social Security Administration along with the possibility of states attempting to preserve their state income tax codes, administrative costs of implementing the tax system could easily grow under H.R. 25. There will be both increased and decreased compliance costs for individuals dependent upon their specific circumstances. The first administrative step in the process of implementing H.R. 25 is for the Federal government to enter into an agreement with interested states for the creation of individual sales tax administrating authorities. Included in these agreements with the states would be requirements including confidentiality, collection of the tax, and remittance of the tax. The collection fee paid to the sales tax administrating authority for the tax would be one-quarter of one percent of the amount remitted. Where a state agrees to become a sales tax administrating authority, the state would need to create a staff, develop software and find locations around their state to register lawful residents. The staffing for the original and continuing registration of all lawful residents would include significant numbers of one time and seasonal employees. Where the state did not determine to participate in the process, the Federal government would also need to go through the process of creating a staff, developing software and finding locations around the state to register lawful residents. The sales tax administrating authority would be responsible for collecting the tax and transmitting to the Federal government. The sales tax administrating authority would be responsible for auditing the payors, registrants and administrating the law. The Treasury would be responsible for creating the underlying paperwork for the sales tax payors and providing rules and regulations. Social Security Numbers – The first step in the process of receiving the prebate is the receipt of a social security card. Social security cards are legally produced only by the Social Security Administration. The processing under H.R. 25 would be exceptional in that every lawful child of every illegal resident would be eligible for the prebate. The requirement of an unlawful resident applying for a social security card for his or her lawful children (born in the United States) is problematic. The relationship between the Social Security Administration and the Immigration and Customs Enforcement (ICE) would need to be vetted and clarified. The relationship between ICE and the sales tax administrating authorities would need to be vetted and clarified. As at least two of these entities would be Federal agencies, there could be enforcement opportunities with respect to immigration matters. This would be a serious issue in the United States Congress and many cities and states. Social Security Administration – State sales tax authorities – information, systems, costs etc. – The system requirements of integrating information systems with fifty separate sales tax administrating authorities would be daunting and expensive. Each state would need to have a system that was integrated with the Social Security Administration and the Social Security Administration would need to be able to move payments from state to state as citizens moved from state to state. The Social Security Administration relies upon the Internal Revenue Service to audit for fraud in the self employment context. The Social Security Administration relies on the requirement of payroll taxes to insure that extra individuals are not added to payrolls for the purpose of collecting social security benefits. Without the Internal Revenue Service and without payroll withholding, this dynamic of ensuring a fraud free social security system would be lost. An entire system of auditing and enforcement would therefore need to be developed and implemented by the Social Security Administration. After obtaining a social security number, every lawful resident would have to submit social security numbers and their family information to the sales tax administrating authority for the purpose of the sales tax administrating authority transmitting the information to the Social Security Administration for monthly payment of the prebate. The sales tax administrating authority would be responsible for ensuring that the applicants were legal citizens, signed various assertations about residence, and that there was sufficient information for the Social Security Administration to mail or electronically deposit the monthly prebate to the lawful resident. The Social Security Administration would be responsible for receiving the information from the sales tax administrating authority, ensuring the accuracy of the information (duplicate social security numbers etc.) and timely sending the monthly prebate checks or making the electronic deposit. Each sales tax administrating authority would receive and transmit to the Social Security Administration changes to the residency, filings including family additions and subtractions, as well as changes of address etc. The information would be updated in perpetuity for births, deaths, changes in address, and marriages. Every lawful resident will be required to annually re-register with the sales tax administrating authority. Assurance that only lawful residents are registered and that no fraud was taking place would be very difficult to achieve. The very nature of large groups of one time and part time employees, which initial and annual registration would require, would exacerbate all levels of risk with respect to fraud and abuse. No state agreeing to be a sales tax administrating authority would have any reason to be concerned with the issue of unlawful residents. State sales tax authorities would have no incentive for accurately performing the registration task as for each unlawful resident considered lawful under H.R. 25, more funds would flow into the state economy. The initial and on-going costs of registering 300,000,000 citizens would be staggering. The sales tax administrating authority would be required to register each seller in the state using federally produced forms, collect the funds from each seller each month and transfer the money less a one quarter of one percent fee to the Federal government. The sales tax administrating authority would be charged with insuring that all sales taxes are paid and with auditing the payors. As discussed previously, the auditing task would include determining who owed use tax on items such as houses being converted from investment to personal use and whether houses were rented at fair market value to family members. Sellers of taxable goods and services would be required to report their sales and pay taxes at least monthly. These reports and payments would be made to the state sales tax administrating authorities. These reports would be required from sellers, including service providers and the self employed. There have to be serious issues with any expectations that small and individual, part-time service providers will comply with these rules. At the lowest income levels, there would be little hope for compliance and a belief that services provided by unlawful residents would result in payments under H.R. 25 would seem to be incorrect. Wage earners – Each wage earner would be responsible for attaining social security cards for all legal residents of his or her home and annually registering the family with the sales tax administrating authority. These individuals would have a significant reduction in paperwork. Each lawful self employed resident would be responsible for attaining social security cards for all legal residents of his or her home and annually registering the family with the sales tax administrating authority. Before selling a product or delivering a product, every person liable to collect and remit taxes pursuant to H.R. 25 would be required to register with the sales tax administrating authority. This would include sellers of products and services for retail and investors owning property for rent. Annually, a filing would be required with the Social Security Administration with respect to self-employment income. A filing would also be required with respect to self employment income with respect to wages paid to third parties. Would a State Agree to become a sales tax administrating authority? The implementation of H.R. 25 in each state would require each state to make very significant and politically charged decisions. The timeliness of these decisions would determine the time line for possible implementation of H.R. 25. The delay of a single state in making its determination and entering or not entering into an agreement with the Federal government to be a sales tax administrating authority would slow the implementation date of the program. A national sales tax with only forty-nine states ready to begin operation is a non-starter. The implementation of H.R. 25 could only begin on a January 1st. H.R. 25 assumes that each state would desire to administer the national sales tax (inclusive of its requirement to annually register every lawful resident). H.R. 25 assumes that the Federal and state governments are capable of registering every legal resident and delivering a monthly check or deposit to each legal resident with competence and fraud-free. If this author were asked for a recommendation by any state as to whether that state should become a sales tax administrating authority, my opinion would be that there is dramatic downside and absolutely no upside to a decision to become a sales tax administrating authority. There is not a single compelling reason for any state to accept the responsibility of being a sales tax administrating authority. There is no significant profit to be made by the state, and there is the possibility of a significant loss as the result of the initial and annual registration of lawful residents. There is the possibility of failure to accomplish a confidential and fraud free registration and the accompanying political and legal fallout there from. There is the possibility that simple participation in this process would have significant negative state-wide political consequences. Would a state repeal its existing income tax? Regardless of whether a state determined to be a sales tax administrating authority, the state would be required to consider whether it should or could continue to administer its own income tax. Without a state eliminating its own income tax, the promise of a reduction in compliance costs and activities for the residents of that state are lost. In states which continued their income tax, the residents would be required to complete state individual and corporate tax returns nearly identical to the current Federal income tax return along with beginning to comply with the requirements of H.R. 25. Forty-five states and the District of Columbia have state income taxes. Virtually every state relies on the Federal income tax system in some major part to administer their state income tax system. Most state individual and corporate tax returns begin with the Federal taxable income of the individual or entity filing the state tax return. Most states refer directly and indirectly to the Internal Revenue Code, and Regulations and case law to provide much, if not all of their legal underpinnings for their law. All states with an income tax have arrangements with the Internal Revenue Service to share audit information and individuals and corporations audited by the Internal Revenue Service generally receive a state billing at the end of the Federal audit process be that with appeal to the courts or through negotiation and billing. Not all, but substantially all individual and corporate audits conducted in the United States are conducted by the Internal Revenue Service. State taxing authorities tend to audit only for state residency and state specific income tax laws. Most states neither have the resources nor the tax expertise to adequately review complex transactions, multi-state or multi-national corporations or complex tax returns. To continue a state income tax system, each State would be required to administer their own law without Federal assistance. This would require recreating all of the elements of Congress, Treasury, Federal courts and the Internal Revenue Service to administer their state tax. If all forty-five states maintained their state income tax systems, the current costs of law, regulation and audit may be multiplied by as much as forty-five times. Further, as time ebbed, undoubtedly, each state would pass laws and rulings not consistent with other states and business and state courts would begin to adjudicate matters differently making the entire issue of complexity an entirely new matter for multi-state businesses. The costs of this would be dramatic. Should a state abandon its income tax and add a new state sales tax to the sales under H.R. 25, sales tax rates would explode. Total sales taxes collected in some states on every retail transaction could easily exceed 43%. A hotel room in New York City with combined hotel tax, national sales tax, state sales tax and local sales taxes could have a total sales and hotel tax rate exceeding 50%. Would a state change its state sales tax to conform to H.R. 25? Currently, most states impose sales taxes, exempting particular items such as food. Today, many or most local governments also impose sales taxes, also exempting particular items such as food. H.R. 25 presents a cascading of issues for every legislature and local government body. If a state collects its disability and unemployment taxes from withholding, either it would have to require withholding on salaries, perhaps as the only withhold if Federal and state income taxes disappear, or determine a new methodology to collect such taxes. Economics for the State - Each state would need to determine whether one-quarter of one percent is a sufficient payment to administer H.R. 25. The dynamics of the decision are fairly robust. First, is there a profit to be made? If not, why would a state be interested in participating? (If the Federal government will come into the state, hire state residents, lease property in the state and buy local products, unless there is a significant profit to the state from becoming a sales tax administrating authority, there would be no compelling financial reason to become a sales tax administrating authority.) The decision with respect to whether a profit can be made for the state in deciding to become a sales tax administrating authority would include a full analysis of implementation costs. As the intial costs would be expended before the first dollar of tax collections, there might be a significant cash drain on the state from the implementation process. Politically, does the state wish to manage and deal with all of the issues of becoming the Internal Revenue Service in a much more visible way than their current state taxing activities? Where a state determines to become a sales tax administrating authority and does not abandon their existing income tax, that state should have no interest in its requirement to provide and/or implement the auditing and enforcement provisions of H.R. 25. When an audit produces one quarter of one percent of any collections to the Federal government, the costs of virtually all audits will exceed the revenues to the sales tax administrating authority. With respect to determining the lawful status of a resident, there would be no revenues resulting from the audit process and therefore no benefit to the state from actively pursuing such audits. Where a state determines to abolish its income tax and adopt the H.R. 25 methodology of taxing everything, there is an argument to be made to stay out of the Federal government’s business and simply consolidate its current tax authorities into one state agency and begin its new sales tax form with: Federal Taxable Retail Sales and Services. There are ample savings available to the state in this scenario. State Decisions – unlawful residents - Lawful / Unlawful Citizens – One of the most contentious issues in the current political arena is the issue of the unlawful resident immigrant. H.R. 25 proposes to exclude unlawful residents from the “prebate”. In certain states and within certain areas of those states, the number and percentage of individuals who are unlawful residents is very significant. The number of families with both lawful and unlawful residents is also very significant and the resulting increased taxation of food and the basic necessities of life would be a serious issue to be confronted by these individuals and these individual states. There would be significant political pressure to have no part of a system that would increase taxes on the poor, lawful residents or unlawful residents. While not politically correct to state, there is the possibility of social instability if prices are raised to the poor, regardless of a prebate or not. Certain areas of the country are populated by significant percentages of unlawful residents along with less economically advantaged lawful residents. This is a formula for isolated civil unrest issues following the implementation of new and significant sales taxes on food. It is of interest that the prebate is intended for any lawful resident. As a result of this notion, all legal alien residents will receive the monthly prebate. Undoing a state sales tax authority agreement – Based on the statutory language, it would be very difficult for the Federal government to “fire” a state that was not doing an adequate job as a sales tax administrating authority. Beyond that, the Federal government would be totally unprepared to take over the work for a sales tax administrating authority if it won such a battle. This paper does not address the long term macro-economic impacts that would accompany the adoption of H.R. 25. Supply side economists argue that lower tax rates generally increase economic activity and therefore are good for everyone. As the express goal of H.R. 25 is to achieve a tax neutral result, the supply side economists should argue that the impact of H.R. 25 is neutral. This excludes the issues of increased state taxes resulting from H.R. 25 requiring the taxation of state government purchases and the loss of the advantage from tax exempt borrowing. The impact of disintermediation of the short term macro-economic impacts should be deeply studied before there is any serious consideration of H.R. 25. Further data needs to be collected with respect to the volatility of the securities markets that H.R. 25 could create. The elimination of all Federal taxation of securities transactions would eliminate any potential for an investor to wait out a sudden drop in the marketplace because of income recognition and tax payment issues. This might or might not cause some level of instability in the securities markets. One of the abilities lost in H.R. 25 is the ability of Congress to stimulate the economy through tax reductions in times of economic decline or malaise. This tool would be permanently lost with a passage of H.R. 25. *Individual Income tax receipts include: Personal income taxes, Capital gains taxes, taxes on dividend income, and the Alternative minimum tax. Source: Congressional Budget Office, Historical Budget Data, http://www.cbo.gov. Issues that should be raised here include: If the government is both paying and receiving the $1,843,400,000,000 of sales taxes on government consumption, should this amount be removed from the schedule? With the advantage being provided to investor-buyers of new residential housing (exemption from the 30% national sales tax), can the taxes being projected from the purchase of new homes be accurate? Are collection costs considered in the analysis? Many other questions need raising and discussion. The President’s Advisory Panel on Federal Tax Reform predicted that a national sales tax of 30% would result in more substantial tax evasion than occurs in the current Federal income tax system. This evasion could only be enhanced where states abolish their income tax structure and add their tax collection amount as an additional sales taxes to the 30% proposed under H.R. 25. H.R. 25 would cause an immediate increase in the cost of state government. The 30% sales tax added to the cost of state purchases would increase state government costs by the amount of retail purchases, 30%. H.R. 25 would result in the loss of economic advantage for state bonds which are issued tax free under the current Internal Revenue Code. There currently are approximately $1,800,000,000,000 in outstanding tax-free state and local debt. Assuming a 2% differential between the tax-free rate and other investment rates, this represents, over time, an increase of $36,000,000,000 in annual costs of local and state governments. There is also the concomitant impact to the value of existing bonds. This impact would be the immediate reduction in value of these bonds which in some cases could destroy the economics of many bondholders. If a foreign buyer, not subject to paying U.S. taxes on U.S. exports, has a 30% price advantage over a U.S. purchaser, that buyer can afford to outbid the U.S. buyer and continue to pay a lower price. This is a problem for U.S. buyers. It is notoriously hard to collect use taxes. Taxpayers often consider use taxes as “for someone else”. Collection would prove very difficult. Empirically, high volume products with traditionally low margins would have resultant and instant price increases under H.R.25. Safeway Corporation currently pays approximately 1% of its sales for its products in Federal income taxes. Without study of any other factors and assuming that there is very little in the way of U.S. income taxes paid by its suppliers in its costs (farmers do not generally earn dramatic profits from their products), to achieve the same after-tax profit with the elimination of the Federal income tax and the implementation of H.R. 25, Safeway would have to increase prices by about $ 11.5 billion dollars a year. This equates to an approximate 27% increase in the price of food. There are cascading impacts to this issue. At the poverty level, the rebate would be recalculated only annually resulting in any immediate disintermediation in prices of low margin, high volume items being born by purchasers for the first year. Beyond the poverty level, the increasing taxes on food would impact other purchasing decisions. The likelihood of legal challenges in the court system to H.R. 25 is significant. These challenges could result in restraining orders with respect to the initially required administrative steps of implementation. A successful attack on H.R. 25 after elimination of the Federal income tax would be a national disaster. If there is any question as to its constitutionality, a constitutional amendment should be the form of this legislative change. Before enactment, at a minimum, a formal finding, available for public review and response by private legal counsel and special interest counsels, by the appropriate legal counsel representing the United States government should be released confirming the constitutionality of H.R. 25. Both the general concept of a national sales tax and the concept of a prebate limited to lawful residents and its enforcement plan should be fully vetted. The language of the sixteenth amendment to the constitution allowing taxation by income tax appears to have been written to provide explicit protection from Article One, sections 4 and 5 of the Constitution. The recent Ninth Circuit of Appeals ruling disallowing the Federal government from using social security numbers as a methodology of policing immigration should cause anyone to give pause to the entire concept of the prebate being limited to lawful residents and the government’s ability to enforce such a provision. Courts could intervene on the issue of lawful residents being the only individuals being able to receive the prebate. The sales tax collection requirement for an unlawful resident represents a significant dilemma. If the registration form asks for a social security number, the unlawful resident will be unable to obtain the correct paperwork to implement the national sales tax under H.R. 25. Those willing and desiring to obey this law, but who remain in the United States illegally would be unable to comply with H.R.25. Fraud – There is ample academic research that tax fraud expands as sales tax rates go up. Tax fraud also logically expands as opportunities increase. Both are a concern under H.R. 25. For states that abandon their state income taxes, combined Federal, state and local sales tax rates could exceed 43%. This is sufficiently high for sales tax fraud to become rampant. The issue of performing a task as a local maintenance person etc. with a price of $500 cash or $650 with a credit card or check cannot be overlooked. As there would be no requirement to pay payroll taxes, there would be incentive for fraud with respect to social security filings. Unless the Social Security Administration dramatically increased staffing, there would be little opportunity for the Social Security Administration to review payrolls from businesses which include family members who actually performed no work. These individuals would be added to the social security benefit lists. Adding a sister, daughter etc would be far too easy. Elimination of the IRS – The plan to eliminate the IRS two years after passage of H.R. 25 would be a mistake. The IRS would need years to complete current audits and a full compliment of auditors would need to be available to audit the last year of the Internal Revenue Code or taxpayers would assume they could get away with anything. Completing their work would take about six years after the passage of H.R. 25. H.R. 25 eliminates the Internal Revenue Service. – H.R. 25 replaces the Internal Revenue Service with fifty separate sales tax administrating authorities. The Treasury will create a new agency to administer the laws of H.R. 25. It is the tax collecting agency that people have hated for centuries, not the name thereof. Closes all loopholes and brings fairness to taxation – In the Internal Revenue Code, one person’s loophole is another person’s definition of fairness. Both the deduction for home interest and a specific credit to encourage research and development can be loopholes for one and intelligent social incentives for another. As people become knowledgeable about H.R. 25, tax planning strategies will develop and loopholes will be identified. Ensures Social Security and Medicare Funding – H.R. 25 no more assures funding for social security and Medicare than the current Internal Revenue Code. H.R. 25 would collect the same revenue as the current payroll tax. Adequate funding for social security and Medicare remains dependent upon actions by Congress. Brings transparency and accountability to tax policy – H.R. eliminates tax policy. Allows American products to compete fairly – Trade policies are by their very nature, very fluid. To the extent that U.S. products begin to arrive in nations where they will ultimately be untaxed, it is safe to assume that trade barriers will be erected to restore the current balance of trade. Enables retirees to keep their entire pension check – This claim is disingenuous. While the pension check will not be subject to income taxes, the purchase of goods and services will be subject to a flat rate national sales tax on all purchases of retail goods and services. For individuals spending their pension check of good and services, this claim is without meaning. Enables workers to keep their entire paycheck - This claim is also disingenuous. While the pension check will not be subject to income taxes, the purchase of goods and services will be subject to a flat rate national sales tax. For individuals spending their pension check on goods and services, this claim is without meaning. Who would respond to criticism from the Club for Growth by calling the conservative, free-market campaign organization the "Club for Greed"? That sounds like Howard Dean, Dennis Kucinich or John Edwards, all Democrats preaching the class struggle. In fact, the rejoinder comes from Mike Huckabee, who has broken out of the pack of second-tier Republican presidential candidates to become a serious contender -- definitely in Iowa and perhaps nationally. Huckabee is campaigning as a conservative, but serious Republicans know that he is a high-tax, protectionist, big-government advocate of a strong hand in the Oval Office directing the lives of Americans. Until now, they did not bother to expose the former governor of Arkansas as a false conservative because he seemed an underfunded, unknown nuisance candidate. Now that he has pulled even with Mitt Romney for the Iowa caucuses with the possibility of more progress, the beleaguered Republican Party has a frightening problem on its hands. The rise of evangelical Christians as the motive force that blasted the GOP out of minority status during the past generation always contained an inherent danger if these new Republican acolytes supported not merely a conventional conservative but one of their own. That has happened now with Huckabee, a former Baptist minister educated at Ouachita Baptist University and Southwestern Baptist Theological Seminary. The danger is a serious contender for the nomination who passes the litmus test of social conservatives on abortion, gay marriage and gun control but is far removed from the conservative-libertarian model of Barry Goldwater and Ronald Reagan. There is no doubt about Huckabee's record during a decade in Little Rock as governor. He was regarded by fellow Republican governors as a compulsive tax increaser and spender. He increased the Arkansas tax burden by 47 percent, boosting the levies on gasoline and cigarettes. When he decided to lose 100 pounds and pressed his new lifestyle on the American people, he was far from a Goldwater-Reagan libertarian. As a presidential candidate, Huckabee has sought to counteract his reputation as a taxer by pressing for replacement of the income tax with a sales tax and has more recently signed the no-tax-increase pledge of Americans for Tax Reform. But Huckabee simply does not fit in normal boundaries of economic conservatism, as when he criticized President Bush's veto of a Democratic expansion of the State Children's Health Insurance Program (SCHIP). Calling global warming a "moral issue" mandating "a biblical duty" to prevent climate change, he has endorsed the cap-and-trade system that is anathema to the free market. Huckabee clearly departs from the mainstream of the conservative movement in his confusion of "growth" with "greed." Such ad hominem attacks are part of his intuitive response to criticism from the Club for Growth and the libertarian Cato Institute for his record as governor. On Fox News Sunday Nov. 18, he called the "tactics" of the Club for Growth "some of the most despicable in politics today. It's why I love to call them the Club for Greed because they won't tell you who gave their money." In fact, all contributors to the organization's political action committee (which produces campaign ads) are publicly revealed, as are most donors financing issue ads. Quin Hillyer, a former Arkansas journalist writing in the conservative American Spectator, called Huckabee "a guy with a thin skin, a nasty vindictive streak." Huckabee's retort was to attack Hillyer's journalistic procedures, fitting a mean-spirited image when he responds to conservative criticism. Nevertheless, he is getting remarkably warm reviews in the news media as the most humorous, entertaining and interesting GOP presidential hopeful. Contrary to descriptions by old associates, he is now called "jovial" or "good-natured." Any Republican who does not sound much like a Republican is bound to benefit from friendly media support, as Sen. John McCain did in 2000 but not today with his return to being more like a conventional Republican. An uncompromising foe of abortion can never enjoy full media backing. But Mike Huckabee is getting enough favorable buzz that, when combined with his evangelical base, it makes real conservatives shudder. Lebanon is a "Wild Place"
Lebanon is a “wild place,” so-said a counterterrorism expert in a personal conversation with me days before former Lebanese president Emile Lahoud stepped down and declared the army in charge of that troubled state, last week. On the one hand, Lebanon is an amazing country with a marvelous history and culture, and a society that places a premium on high education. It’s also known for its stunning vistas, a unique sense of style and fashion paralleled only by the Parisians and the Milanese, a renowned nightlife, and its breathtakingly beautiful women. VIDEO: Is Lebanon Headed Toward Crisis? On the other hand, Lebanon has no president. They’ve been unable to elect one in several attempts. And if the country’s parliamentarians – many of whom are heavily guarded and under threat of death – do not elect a chief executive by the end of this week, the power vacuum will continue to grow. The army leadership may feel compelled to tighten its authority over the country (perhaps declaring martial law). The old civil war militias may rise up. The parliament may splinter. And Hezbollah – a Shiia Muslim group and one of the world’s most formidable terrorist organizations – may decide the time is right to consolidate its forces in Lebanon and attempt to seize power. Hezbollah, described by former British Prime Minister Tony Blair’s senior terrorism advisor, Richard Kemp, “is probably the world’s most effective terrorist organization, and that includes Al Qaeda.” Worse: Hezbollah’s guerrilla-force strength – numbering in the thousands -- and position in Lebanon has never been stronger. The group, supported by Syria and heavily financed and trained by the Islamic (Iranian) Revolutionary Guard Corps, has tremendous influence, nationwide (and a dangerous and growing footprint throughout the rest of the world): Their yellow and green fist-and-rifle flags fly all over the country. They have permeated the ranks of the armed forces at all levels. They control or influence many of Lebanon’s businesses, other commercial enterprises, and telecommunications. They have a very strong lobby in the Lebanese media. They even control some Lebanese-based international media. And they are armed to the teeth. What would stop them? The army? Doubtful. The military leadership under armed-forces commander-in-chief Gen. Michel Sleiman has so-far given Hezbollah a free pass despite the fact that United Nations Security Council Resolution 1559 calls for the disarming of all militias in Lebanon. “Hezbollah is a resistance,” Sleiman told me in his office at the Ministry of Defense in Beirut (not far from a Hezbollah-controlled district and virtual weapons depot where the legitimate army and police do not enter). Practically all of the Lebanese generals I spoke with while I was in Lebanon in September and October told me the same thing. They say that, because they know by labeling Hezbollah a “resistance movement,” the terrorist organization avoids the label “militia.” Hezbollah and its parent companies Syria and Iran have deep roots in the army leadership. And a huge percentage of the rank-and-file are pro-Hezbollah Shiia. Hezbollah also blew up 220 U.S. Marines, 18 sailors, and three soldiers during the organization’s formative years nearly a quarter century ago. Today Hezbollah has global reach (cells in the United States, Europe, and elsewhere), lots of money, men, and arms (more so in fact than what they had prior to the Israeli-Hezbollah war in 2006). The centerpiece of this Syro-Iranian supported terrorist army is positioned in Lebanon (one of their largest strongholds, Al Dahiyeh, is located within minutes of the Lebanese parliament and government buildings in Beirut). Hezbollah is actively training in Lebanon, conducting exercises that sometimes aren’t reported, and transporting militiamen, which is rarely reported. They are manipulating the press. The army won’t do anything to stop them. Many of the parliamentarians are hiding behind layers of security in Beirut’s Phoenicia Hotel. They never venture outside without heavy military or paramilitary protection. They never open the curtains to their rooms for fear of snipers. And, again, the country is without a president. Frankly, what’s next is anybody’s guess. Believe it or not, federal spending has been stable at around 20 percent of the gross domestic product for more than 50 years, ever since it settled down after World War II. Conservatives have been relatively successful in holding down the growth of big government for the last half-century. The bad news is that this will change over the coming decades. According to the latest projections of the Congressional Budget Office and the General Accounting Office, federal spending will soar by 2040 to close to 40 percent of GDP, or more. This is primarily due to our nation's big entitlement programs, Social Security, Medicare and Medicaid. Add in state and local spending, and government in America at some point would be consuming more than 50 percent of GDP. The crushing burden of taxes and spending this implies will crater the economy, destroy any notion of limited government and strangle freedom of enterprise. Unfortunately, even some conservatives are now saying that the answer to entitlement spending will require large tax increases. Some want to try to cut a grand deal between liberals and conservatives, Republicans and Democrats for huge entitlement cuts in return for tax increases. Nonsense! Slapping two bad ideas together does not make one good idea. For those who call ourselves progressive conservatives, this would mean agreeing to a still massive increase in government spending to around 30 percent of GDP or more, along with an enormous tax increase. In a path-breaking article in Barron's on Oct. 8, Peter Ferrara of the Institute for Policy Innovation and the American Civil Rights Union, offers a better way. Ferrara argues that the yawning entitlement financing gap is far too big to try to address with entitlement cuts, and tax increases would be counterproductive and unfairly burdensome for working people. He argues that instead we need to think outside the box of our current entitlement structures and seek to reform them from the bottom up. Today's entitlement programs are based on outdated, late 19th century tax and redistribution models. Reform to modernize them for the 21st century would bring in much greater reliance on modern capital and labor markets to achieve the goals of these programs. Ferrara shows in the article how such reform can leave us with new programs that serve the current beneficiaries far better but require only a fraction of the government spending of the current programs. For example, personal accounts for Social Security would provide workers with a much better deal and higher benefits than the current, old-fashioned Social Security framework can even promise, let alone what it can pay. But such accounts are also enormously powerful in reducing government spending because they shift huge portions of such spending out of the public sector altogether and into the private sector. The very thorough and comprehensive reform bill introduced in the last Congress by Rep. Paul Ryan, R-Wis., and Sen. John Sununu, R-N.H., would allow workers the freedom to choose to eventually shift their Social Security retirement benefits to private sector personal accounts. That alone would reduce future government spending by more than 5 percent of GDP, an enormous and unprecedented reduction, but in so doing would give workers a far higher rate of return for their retirement. The accounts could then eventually be expanded at the choice of each worker to provide for private life and disability insurance to replace Social Security survivors and disability benefits. The accounts could even eventually be expanded to cover the payroll-tax-financed portion of Medicare, producing an annuity in retirement that could be used to purchase private health insurance that would be a much better deal than Medicare. These provisions would reduce federal spending by well over 10 percent of GDP. At the same time, they would transform the payroll tax from a tax to a wealth-building asset owned and controlled within each family. What a revolution that would be for the personal prosperity of working people. Ferrara advances a second fundamental reform concept building on the huge success of the 1996 legislation block granting the old Aid to Families With Dependent Children program back to the states. The welfare rolls from the old program were reduced by close to 60 percent nationwide as a result, a shocking success. Ferrara argues that we could now block-grant the remaining major federal welfare programs to the states, as well, including budget-busting Medicaid, food stamps and even some housing programs. With these funds and broad discretion, we can build new welfare systems nationwide based on getting the poor into real jobs, real private health insurance with vouchers and even home ownership. This was the vision of Abraham Lincoln of a stakeholder society where everyone has a direct share of the American dream. To pursue these reforms, Ferrara has helped establish a new Entitlement Reform Without Tax Increases Working Group. I suggest joining up with them, as I have. Maimonides, the 11th century Talmudic philosopher, wrote that "the highest form of welfare is to prevent people from needing welfare." How very true. America the greatest country in the world. One of the most widely held beliefs in the contemporary world -- so widely held it is not disputed -- is that, with few exceptions, the world hates America. One of the Democrats' major accusations against the Bush administration is that it has increased hatred of America to unprecedented levels. And in many polls, the United States is held to be among the greatest obstacles to world peace and harmony. That it is the left -- and those influenced by the left-leaning news and entertainment media -- that hates America can be easily shown. Take Western Europe, which is widely regarded as holding America in contempt, but upon examination only validates our thesis. The French, for example, are regarded as particularly America-hating, but if this were so, how does one explain the election of Nicolas Sarkozy as president of France? Sarkozy loves America and was known to love America when he ran for president. Evidently, it is the left in France -- a left that, like the left in America, dominates the media, arts, universities and unions -- that hates the U.S., not the French. The same holds true for Spain, Australia, Britain, Latin America and elsewhere. The left in these countries hate the United States while non-leftists, and especially conservatives, in those countries hold America in high regard, if not actually love it. Take Spain. The prime minister of Spain from 1996 to 2004, Jose Maria Aznar, is a conservative who holds America in the highest regard. He was elected twice, and polls in Spain up to the week before the 2004 election all predicted a third term for Aznar's party (Aznar had promised not to run for a third term). Only the Madrid subway bombings, perpetrated by Muslim terrorists three days before the elections, but which the Aznar government erroneously blamed on Basque separatists, turned the election against the conservative party. The answer is that most people know there is no country in the world more accepting of strangers as is America. After three generations, people who have emigrated to Germany or France or Sweden do not feel -- and are not regarded as -- fully German, French or Swedish. Yet, anyone of any color from any country is regarded as American the moment he or she identifies as one. The country that the left routinely calls "xenophobic" and "racist" is in fact the least racist and xenophobic country in the world. Given that it is the left and the institutions it dominates -- universities, media (other than talk radio in America) and unions -- that hate America, two questions remain: Why does the left hate America, and does the American left, too, hate America? The answer to the first question is that America and especially the most hated parts of America -- conservatives, religious conservatives in particular -- are the greatest obstacles to leftist dominance. American success refutes the socialist ideals of the left; American use of force to vanquish evil refutes the left's pacifist tendencies; America is the last great country that believes in putting some murderers to death, something that is anathema to the left; when America is governed by conservatives, it uses the language of good and evil, language regarded by the left as "Manichean"; most Americans still believe in the Judeo-Christian value system, another target of the left because the left regards all religions as equally valid (or more to the point, equally foolish and dangerous) and regards God-based morality as the moral equivalent of alchemy. Last Thursday Townhall contributor Hank Adler published a column on this website entitled “A Hard Look At The Fair Tax (sic)”. Almost immediately the emails started pouring into my show – literally by the hundreds – urging me to post a response to Adler’s rather stinging critique of the FairTax. Since Congressman John Linder, the author of H.R. 25, The FairTax Act, and I wrote “The FairTax Book” in 2005 we’ve seen an unprecedented and ever-growing nationwide interest in this tax reform idea. Let’s face it, you have to be doing something to capture the imagination of the American people to have a book on taxes debut No. 1 on The New York Times Bestsellers List. There are some, though not in what we call the mainstream media, who think that Governor Mike Huckabee’s embrace of The FairTax is an important element to his rise in the GOP presidential sweepstakes. Now to make this column worth reading for those of you who are not familiar with the FairTax, a very quick introduction is in order. The FairTax eliminates all corporate, business and personal federal income taxes, all payroll taxes, capital gains taxes, dividend taxes and estate taxes, and replaces them all with one embedded sales tax on the sale of all goods and services at the retail level. Tens of millions of dollars in research show that the corporate and personal income and payroll taxes that will be eliminated by the FairTax end up being paid by consumers at the retail level. The average amount of embedded taxes in the cost of everything we buy at retail is approximately 22 percent. This would mean that we are replacing the embedded cost of our present tax system (22 percent) with the embedded FairTax (23 percent). Every household in America will receive a check or a credit to an account at the beginning of every month equal to the amount of FairTax that household would be expected to pay during that month on the basic necessities of life. Poverty figures for various family sizes from the Commerce Department will be used to calculate the size of this “prebate.” This guarantees that nobody will have to pay the FairTax on the basic necessities. There is so much more to this proposal, but to learn more you really need to devour the FairTax website (http://www.fairtax.org) or order a copy of The FairTax Book online. OK .. there’s your briefest of introductions. Let’s move on to the reason for this column. Congressman Linder and I are no strangers to dealing with out-of-left-field attacks on the FairTax. When it comes to criticisms, it’s somewhat safe to say that we’ve heard it all. We’re both such strong believers in the FairTax and the massive transformation it would bring about, not only in our daily lives, but in the nature of our governance and our economy, that neither of us minds responding to substantive and well thought out critiques. We have, in fact, written a follow-up book entitled “FairTax, The Truth” that will be published by Harper Collins in February of next year. Linder and I do, however, confess to a certain level of exasperation at having to spend the time responding to critiques proffered by those with a limited understanding of the FairTax, those who have chosen to ignore the basics of the FairTax, or those who just outright misrepresent the plan, in order, we suppose, to give support to a more damming criticism. Adler’s column wanders (somewhat aimlessly) over 25 pages. With “FairTax, The Truth” hitting the book stores in less than three months there is no real need to use quite so much of your precious toner or ink cartridge in our response. If someone criticized your purchase of a four-cylinder one-ton pickup truck on the basis that four cylinders simply can’t provide the power necessary to get any serious work done – and if the reality was that you were actually purchasing a hefty V-8 – you might be predisposed to ignore any other criticisms of your new truck on the basis that the critic simply doesn’t know what he’s talking about. That is the case with Adler’s FairTax essay. At various points in Adler’s screed he exhibits a complete lack of understanding – even an awareness -- of the concept of embedded taxes. Suspecting that there is a slight chance that some of you who are devouring every word of this column share Adler’s lack of awareness of embedded taxes, a short explanation is due. Simply put … every person, business or other entity that has any involvement at all in bringing any product or service to the retail marketplace incurs a tax cost arising from that involvement; and every one of these entities will incorporate that tax cost into whatever they charge for their labor, ideas or material goods. All of those tax costs come home to roost in the final retail cost of that product or service, to the average tune of 22 percent. Again, simply put, the FairTax removes those embedded tax costs from the price of all goods and services at the retail level and replaces them with the embedded 23 percent FairTax. This is where you find the fatal flaw in Adler’s critique of the FairTax. Amazingly, not once in his entire 25-page essay does Adler mention the concept of embedded taxes in the price of everything we buy, or the fact that those embedded taxes will be removed by the FairTax. Not only does he not mention the embedded taxes, he doesn’t even give the vaguest of hints that he even knows they exist! To fail to understand, or to gloss over or simply ignore this crucial concept in a discussion of the FairTax is to render your entire argument lacking in credibility and barely worthy of response. But, being the argumentative type, I’m going to continue laying waste to at least some of Adler’s arguments. Adler’s essay does not exactly flow effortlessly from point to point. So, in the name of brevity and out of a certain sense of mercy, I’ll just take aim at a few targets of opportunity here. First of all we have this silly insistence on quoting the FairTax rate as 30 percent rather than 23 percent. This childish exercise is the favorite of people who either have a vested interest in preserving our present tax system, or who feel the need to criticize but lack the ability to make their criticism meaningful. The FairTax is embedded in the price of everything you buy at the retail level. If you buy a $100 griddle, the price tag for the griddle will say $100. When you get a receipt for your purchase that receipt will itemized to show that $77 of the total cost will be retained by the retailer and $23 will be sent to the federal government as the FairTax. The total is $100, just as the price tag says. In most government schools across the country they will teach that the $23 going to the government is 23 percent of $100 you paid for the griddle. That, my friends, is why the FairTax is quoted as 23 percent; because it is embedded into not added onto the price of your purchase. Another reason to quote the FairTax as an embedded tax is because it will essentially be replacing the 22 percent embedded tax already present in the price of everything you buy, as covered above. • The FairTax is designed to replace the federal income tax. The federal income tax is quoted as an embedded tax. If you were to quote the income tax as an excusive tax the 25 percent bracket would be quoted as 33.3 percent, and the top bracket would be quoted as 54 percent. • The FairTax will replace all payroll taxes. Payroll taxes are quoted as embedded taxes. If you were to quote your entire Social Security tax bill (and that includes your employer’s so-called “contribution,”) as an exclusive tax the rate would be 20.5 percent. I don’t know, maybe it’s just me, but it seems to me that if people like Adler are so hell-bent on quoting the FairTax as an exclusive tax, why not quote the income tax and the payroll taxes the same way? Doesn’t that seem fair to you? In case Mr. Adler is reading this … one more time. We’re replacing embedded taxes with embedded taxes. Apples to apples, you know. Now let’s get on to addressing some of the specific points in Adler’s column. To make things easy, I’m simply going to put his quotes in a nifty little boxes, followed by my response. Here Adler once again ignores the role of embedded taxes. The price of consumer goods in this country would remain essentially the same. The embedded taxes are merely replaced by the FairTax. How, then, does anyone suffer a decrease in purchasing power? This is already getting monotonous. How does your purchasing power go down when you have the same amount of money in your pocket, perhaps more with the prebate, and the things you are buying cost pretty much the same? What? These incentives Adler is talking about are tax deductions or credits. Of what possible value is a tax deduction or credit to someone who pays no income taxes? The income tax is gone under the fair tax; and Adler is going to sit around bemoaning the loss of tax deductions? This is like complaining that your 20% off coupons for bread are rendered worthless when the bakery starts giving bread away for free. Every one of these “conflicting studies” first changes the terms of H.R. 25 before they reveal that the tax rate might not necessarily be 23 percent. When the FairTax is scored as written economists agree on the proposed tax rate. Different interpretations of the rule! Oh, the humanity! And we all know that there are no differing interpretations of the rules under our present tax code, don’t we? Even the IRS can’t accurately calculate a taxpayer’s tax liability fifty percent of the time. Oh … and that part about the Treasury issuing volumes of rules and regulations. The current tax code takes tens of thousands of pages. H.R. 25 is 133 pages long. H.R. 25 proposes a 23% “tax inclusive” sales tax rate. Sales taxes are not traditionally described in a “tax inclusive” manner. Sales taxes are traditionally described in a “tax exclusive” manner. The FairTax is not a “traditional” sales tax. Consumer prices are traditionally quoted without the sales tax. Prices under the FairTax are quoted with the sales tax included. If Adler is so concerned about tradition, then let him sit on the sidelines while others with a view to the future get some things done. At implementation, existing savings will have diminished purchasing power of 30%. There’s that 30 percent silliness again .. and once again Adler completely ignores (if he’s aware of it at all) the fact that prices do not go up when the FairTax is implemented. The embedded taxes from our present tax system are removed, the FairTax is added … and we’re pretty much right back where we started. When you take money out of your savings account under our current tax scheme, and when you spend that money, you’re paying the 22 percent embedded tax. After implementation you’ll be paying the 23 percent embedded FairTax instead. Wrong, Mr. Adler. Flat out wrong. A tax code should exist to procure the funds necessary for the operation of government, not to manipulate human or business behavior. Besides, the form of these “social and business incentives, benefits and disincentives” consist basically of tax credits or deductions. Credits and deductions are meaningless when there is no longer an income tax. • The home mortgage interest deduction is of no value whatsoever to someone who does not pay income taxes. • People don’t contribute to charity in order to get a tax deduction. Who would give away $1000 just to save $350 on their taxes? Somehow that doesn’t seem to be a good trade to me. • If lower tax rates on capital gains encourage investment … think what NO taxes on capital gains would do. That’s life under the FairTax. Look … I could go on and on picking apart Adler’s FairTax critique. You can see how easy this is. It’s like hunting over a baited field. This is often mentioned by Fair Tax proponents (who should know better), but I don't think it carries any water. They claim corporations pay 23% (or whatever number) in taxes, and if removed, they could lower the cost of their goods by 23%. Problem is, that is 23% on their PROFITS, not their COSTS. Most company's taxable profits rarely exceed 15% (most are under 10%, some even lose money over the course of a year). Now please excuse my Norwegian .. but what in the wide, wide world of sports is this character talking about? A 23% tax on profits? Now we can really be charitable here and suppose that this character is referring to the average 22 percent embedded taxes in every product and service we buy … but by what incredible twist of logic can some (presumably) government-educated person even bring themselves to put that thought process on paper? Implementation of the FairTax would constitute the biggest transfer of power from the government to the people in the history of this Republic. Perhaps that is what frightens Mr. Adler the most. The postwar relationship between Iraq and the United States is now a broader public topic. This week, the White House and the Iraqi government announced that state-to-state discussions are taking place with the goal of reaching detailed agreements that will govern Iraq and America's long-term political, economic and military ties. Iraqis have asked for "an enduring relationship with America." I use the term "broader public topic" because this matter has been a subject of constant discussion since April 2003, with little of that discussion hush-hush. When I reported in May 2004 for duty in Iraq, the first document dropped on my desk was a draft of U.N. Security Council Resolution 1546. After reading it with great interest, I discussed it with one of the very smart young majors in the Multi-National Corps-Iraq plans section. The very smart young major was already in the polymathic process of analyzing requirements and aligning "capabilities with tasks" (who will do what) in order to support the resolutions stipulation that Iraq hold "direct democratic elections ... in no case later than 31 January 2005." Resolution 1546 was officially passed on June 8, 2004. If you're a wire-service editor, eight months is an eon -- but if you're trying to politically reinvent Mesopotamia, it's a millisecond. The January 2005 Iraqi election succeeded, giving terrorists and tyrants a disturbing "purple finger" -- the very public ink stains marking the fingers of Iraqi voters. The evidence that al-Qaida has suffered a major strategic information defeat in Iraq continues to mount. StrategyPage.com noted on Oct. 27, 2005, that "the Moslem media is less and less willing to be an apologist for al-Qaida, at least when it comes to killing Moslem civilians" and that the Iraqi media in particular "really has it in for al-Qaida." On Oct. 1, 2006, StrategyPage.com argued that "dead Iraqis were killing al-Qaida. ... Westerners, unless they observe Arab media closely, and have contacts inside the Arab world, will not have noted this sharp drop in al-Qaida's fortunes." Within the last three months, the "trend" (made of incremental successes) has become "fact." Is this victory in Iraq? No. But it suggests we've won a major battle with potentially global significance. What the Pentagon calls "the governmental (political participation and structure building), information (intel, media and political perception) and economic (economic development, infrastructure creation) lines of operation" will ultimately secure victory in Iraq, and these operations will take another six to eight years of effort. As for the "security line of operation" (military), the U.S.-Iraqi "postwar relationships" discussion indicates both are preparing for "strategic overwatch," where U.S. "quick reaction" forces are positioned to help Iraq deter external (e.g., Iranian) threats. Strategic overwatch may be a couple of years away, say mid-to-late 2009. Achieving that would constitute a limited victory. In responding to my column of Nov. 13, Tom Ricks at The Washington Post asked me to note his Oct. 15, 2007, article on al-Qaida's information warfare defeat. And a fine report it is. As Mike Huckabee rises in the polls, an inevitable process of vetting him for conservative credentials is under way in which people who know nothing of Arkansas or of the circumstances of his governorship weigh in knowingly about his record. As his political consultant in the ea rly ’90s and one who has been following Arkansas politics for 30 years, let me clue you in: Mike Huckabee is a fiscal conservative. A recent column by Bob Novak excoriated Huckabee for a “47 percent increase in state tax burden.” But during Huckabee’s years in office, total state tax burden — all 50 states combined — rose by twice as much: 98 percent, increasing from $743 billion in 1993 to $1.47 trillion in 2005. In Arkansas, the income tax when he took office was 1 percent for the poorest taxpayers and 7 percent for the richest, exactly where it stood when he left the statehouse 11 years later. But, in the interim, he doubled the standard deduction and the child care credit, repealed capital gains taxes for home sales, lowered the capital gains rate, expanded the homestead exemption and set up tax-free savings accounts for medical care and college tuition. Most impressively, when he had to pass an income tax surcharge amid the drop in revenues after Sept. 11, 2001, he repealed it three years later when he didn’t need it any longer. He wants to repeal the income tax, abolish the IRS and institute a “fair tax” based on consumption, and opposes any tax increase for Social Security. And he can win in Iowa. When voters who have decided not to back Rudy Giuliani because of his social positions consider the contest between Mitt Romney and Mike Huckabee, they will have no difficulty choosing between a real social conservative and an ersatz one. Romney, who began as a pro-lifer and switched in order to win in Massachusetts, and then flipped back again, cannot compete with a lifelong pro-lifer, Huckabee. But Huckabee’s strength is not just his orthodoxy on gay marriage, abortion, gun control and the usual litany. It is his opening of the religious right to a host of new issues. He speaks firmly for the right to life, but then notes that our responsibility for children does not end with childbirth. His answer to the rise of medical costs is novel and exciting. “Eighty percent of all medica l spending,” he says, “is for chronic diseases.” So he urges an all-out attack on teen smoking and overeating and a push for exercise not as the policies of a big-government liberal but as the requisites of a fiscal conservative anxious to save tax money. So what happens if Huckabee wins in Iowa? With New Hampshire only five days later, his momentum will be formidable. The key may boil down to how Hillary does in Iowa. Hillary? Yes. If she loses in Iowa, most of the independents in New Hampshire will flock to the Democratic primary to vote for her or against her. That will move the Republican electorate to the right in New Hampshire — bad news for Rudy, good news for Huckabee. But if she wins in Iowa, there will be no point in voting in the Democratic primary and a goodly number will enter the GOP contest, giving Rudy a big boost. And afterward? If Romney wins Iowa, New Hampshire, Michigan and South Carolina, sweeping the early prim aries, Giuliani will have a very tough task to bring him down in Florida or on Super Tuesday. It can be done, but it’s tough. But if Romney loses in Iowa (likely to Huckabee) then Rudy can survive the loss of Iowa and even New Hampshire without surrendering irresistible momentum to Romney. In any event, neither Hillary nor Giuliani will be knocked out by defeats in Iowa and New Hampshire. Their 50-state organizations, their national base and their massive war chests will permit them to fight it out all over the United States. Even if they lose the first two contests, they will remain in the race and could well come back to win. (CNSNews.com) - As a deadline fast approaches to finalize negotiations on Kosovo's future status, leaders of the country's Muslim ethnic Albanian majority have reiterated their intention to declare independence next month despite Serbia's opposition, raising fears of a fresh war in the fragile Balkans. A number of European countries also worry that independence for the province -- which remains legally a part of Serbia but has been under U.N. administration since the end of NATO's 1999 war against Belgrade -- will stoke secessionism in their own regions. Russia, a longstanding ally of Serbia, is opposed to Kosovo's breakaway, while the United States supports a U.N.-mediated plan for "supervised independence" that includes guarantees for Kosovo's Orthodox Christian Serbs, who account for 10 percent of the territory's two million people. Russia earlier this year rejected the plan, named for U.N. mediator Martti Ahtisaari, and threatened to use its Security Council veto to block it. In a bid to break the deadlock, a "troika" of U.S., Russian and European Union (E.U.) mediators has held six rounds of talks with Serbs and Kosovar Albanians since August, and are due to give their final recommendations to the Security Council on December 10. Last-ditch talks in Austria broke down this week, and Albanian leaders say they will declare independence once the deadline expires. Kosovo President Fatmir Sejdiu said a declaration of independence would happen "very quickly," a position also taken by prime minister-in-waiting Hashim Thaci, whose party won Nov. 17 elections on a pro-independence platform. The Serbian minority overwhelmingly boycotted the election. But Serbian Prime Minister Vojislav Kostunica told mediators in Austria that Belgrade would treat a unilateral declaration of independence as "null, void and non-binding." "Serbia will not let an inch of its territory be taken away," he told reporters in the resort town of Baden, where the inconclusive talks were held. Kostunica has offered Kosovo wide-ranging autonomy while remaining part of Serbia, but the Albanians leaders reject anything short of independence. Kosovo's outgoing prime minister, Agim Ceku, in an article posted on the Kosova News Agency Web site Friday, predicted that the coming declaration of independence would win "prompt recognition by the international community." Ceku said an independent Kosovo was keen to cooperate with Serbia on a range of issues, from cross-border freedom of movement to the fight against organized crime. But he also warned that any "aggressive" response by Serbia -- such as closing the border or imposing sanctions -- "will be damaging not just for Kosovo but also for Serbia and the region." He again dismissed the notion that Kosovar Albanians would accept "any kind of confederation with Serbia." Both Ceku and his incoming successor, Thaci, are former members of the Kosovo Liberation Army (KLA), an often-controversial ethnic Albanian guerrilla group that fought against the forces of what was then Yugoslavia during the late 1990s. The conflict, which cost some 10,000 lives, was brought to an end when NATO in 1999 launched an air campaign against Belgrade, forcing Serbian forces to withdraw from the province. Serbian officials have warned that Western endorsement of Kosovo's independence would turn most Serbs against the U.S. and Europe and towards Russia. Serbia also has threatened steps that would be disruptive in the region if Kosovo declares independence, including encouraging a Serb enclave in neighboring Bosnia and Herzegovina, called Republika Srpska, to seek independence. That in turn would destabilize that formerly war-torn country and jeopardize the 1995 Dayton peace accord. But despite the threats, many analysts doubt Serbia would follow through, in part because it has aspirations to join the E.U. eventually, and polls show that half the population wants E.U. membership. Nonetheless, the possibility of a new crisis has set off alarm bells. "There could be a new crisis in the Balkans by Christmas," Britain's Conservative Party leader David Cameron, in his first visit to Washington as leader of his party, said in a speech Thursday. He called for concerted and decisive action, including preparing the NATO force in Kosovo for possible trouble; sending a clear message to Serbia's leaders about the costs of any disruptive reaction to independence for Kosovo; and making it clear to Russia -- which was "playing a less than helpful role" -- that it was expected to act responsibly. Although Cameron backed the Bush administration's support for Kosovo's independence, within his own party there are differences over the issue. Charles Tannock, a Conservative member of the European Parliament and a party spokesman on foreign affairs, wrote last month that Western backing for a declaration of independence "will incite instability and potentially even violence elsewhere." The "Kosovo precedent" could boost secessionists in Spain and Cyprus, he said. Russia, meanwhile, might respond by unilaterally recognizing Moldovia's breakaway territory of Transdnistria; Georgia's Abkhazia and South Ossetia in Georgia; the ethnic Russian-majority region of Crimea in Ukraine; and Azerbaijan's separatist enclave of Nagorno-Karabakh -- destabilizing those countries and risking reigniting "frozen conflicts." Most members of the 27-member E.U. are supportive of the Ahtisaari proposals, and are expected to recognize an independent Kosovo, although Cyprus and Greece are among those still reluctant. The U.S. State Department maintains that Kosovo is a unique situation, with a unique U.N. mandate, and that its independence will not have an impact on other conflicts in the region. The department announced Thursday that Secretary of State Condoleezza Rice will meet with NATO allies in Brussels on December 7 -- three days before the Kosovo deadline -- and that Kosovo would be on the agenda. WASHINGTON -- It is very rare, if not unheard of, to catch a presidential candidate, especially a Republican, in the act of saying he or she would be willing to sign any tax increase that lawmakers wished for. But that's what happened to former Arkansas Gov. Mike Huckabee, who has rocketed to a statistical tie in Iowa with Mitt Romney, largely as a result of the former Baptist minister's support from evangelical voters in the nation's first caucus state. The Club for Growth, an effective tax-cut advocacy group, has been on Huckabee's back almost from the beginning of his candidacy, sending out e-mail blasts to party conservatives that paint an abominable picture of his record on taxes. Huckabee has been campaigning as a tax cutter, and indeed he did slash some state taxes during his two terms as governor, but he raised far more than he cut. The Cato Institute, which monitors the fiscal records of the nation's governors, gave him a poor-to-failing grade on spending and taxes. The Club for Growth has also examined his tax and spend record and found it wanting. Its verdict: Huckabee could not be trusted to hold the line on taxes, let alone push it back. Huckabee of course rejects the charges and said they do not take into account the many taxes he also cut. He insists he is a committed tax-cutter who could be trusted to shrink the size of government. But seeing is believing, and the visual record backs the Club for Growth up; the Arkansas Journal blog has uncovered a video of Huckabee addressing the state legislature, virtually begging them to raise any taxes they wanted, and saying that he would sign the increases into law. Here's what then-Gov. Huckabee told Arkansas lawmakers: "Again, let me state what I've said privately as well as publicly, but I want to get it on the record again. There's a lot of support for a tax at the wholesale level for tobacco, and that's fine with me; I will very happily sign that because it's a revenue stream that will meet the needs if enacted at a level that will help us to meet that $90 to $100 million target, and that's what I would begin to focus your attention on -- is the target. "Some have suggested the retail level of tobacco; if that ends up being your preference, I will accept that. Others have suggested a surcharge on the income tax; that's acceptable; I'm fine with that. Others have suggested, perhaps, a sales tax; that's fine. "Yet others have suggested a hybrid that will collect some monies from any one or a combination of those various ideas, and if that's the plan that the House and Senate agree upon, then you will have nothing but my profound thanks." This does not sound like someone who is willing to hold the line on taxes, nor find places in his budget-as many governors have done-where he could cut spending instead of having taxpayers foot the bills for bigger and bigger government. Huckabee says he would like to eliminate the Internal Revenue Service and replace the income tax with the so-called Fair Tax, which would impose a national sales tax on virtually everything we buy. But such a tax would be a disaster for this country, especially for low- and middle-income Americans who spend a disproportionate portion of their earnings -- in many cases all of it -- on the necessities of life. It would wreak untold havoc on the business community, driving down retail sales and creating an underground economy that would undermine America's productive marketplace -- especially small businesses that produce most of the jobs in our country. The Club for Growth was formed with one purpose in mind: to promote economic growth by lowering the tax rates, simplifying the tax code and providing tax incentives to expand business formation, savings, investment and economic opportunity. 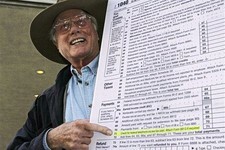 It has praised the tax-cut proposals of Mitt Romney, Fred Thompson and other contenders for the Republican nomination. But last week Huckabee labeled the respected tax-cutting group "The Club for Greed," a charge that sounded more like the invective spewed forth from Al Gore, Howard Dean or socialist Bernie Sanders. The Arkansas Republican is fond of bashing corporate CEOs and their salaries, thinks a higher minimum wage won't hurt entry-level job creation, and apparently doesn't mind slapping higher sales taxes on the most vulnerable people in our economy. The next president will face huge fiscal issues in 2009: such as rising entitlements that threaten to engulf the federal budget and what to do about President Bush's tax cuts which are due to expire in 2010, a demise that would raise taxes by trillions of dollars. That's when we're going to need strong, principled leadership to keep a likely Democratic Congress from sending income taxes through the roof. It's something Iowa voters need to think deeply about in the days to come.